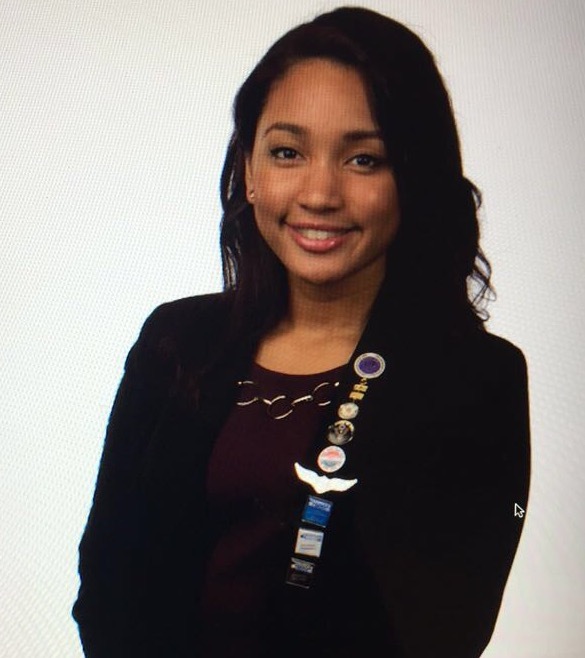 Ms. Krystal Lanier, a second year student in the Miami Dade Honors College, embodies the characteristics of a focused, fierce, fair and friendly leader. Ms. Lanier eagerly takes advantage of the many opportunities offered by not only the Honors College but the entire institution. Embracing her Honduran and African-American background, Ms. Lanier freely welcomes learning about different cultures, their philosophies and how they interact with one another. Recognizing her abilities in public speaking, leadership and advocacy, she acts as an active member of several organizations such as: The Mu Epsilon Chapter of Phi Theta Kappa International Honor Society’s Vice President, Student Government Association’s Public Relations Director, and the Political Science Club’s Secretary. Her involvement in a diverse group of clubs makes way for her personal and professional growth and experience. As a global citizen, Ms. Lanier zealously serves her community each weekend and encourages her peers to show genuine appreciation for their community. Acknowledged for her dedication to service, Ms. Lanier earned the Presidential Service Volunteer Service Silver Award for acquiring over 200 community service awards during her first year at Miami Dade College. Presently, focusing on civic engagement and promoting democracy, her aspirations to empower and educate the youth in her community truly set the standard of an exceptional leader. In her efforts towards voter registration, Ms. Lanier helped North Campus’ Institute for Civic Engagement and Democracy and the Campus Elections Engagement Project reach the surpassed goal of 1,700 newly registered individuals before the General Election deadline. Along with her goal to register individuals, Ms. Lanier strongly supported educating the student body during political and social issues workshops and collaborating with community partners who have the knowledge and experience to educate our students. Publicly demonstrating her passion for promoting democracy, Ms. Lanier had the honor and opportunity to host the Rally to Vote event and introduce North Campus’ President Malou C. Harrison and the Supervisor of Elections, Christina White. Looking across the stage and seeing the crowd of students pumped about this amazing effort to promote democracy, she understood the purpose of the celebration of National Voter Registration Day-- a day where the students of MDC, come together to celebrate the power of our right to vote. Always stepping up to the plate and being recognized for her poise during public appearances, Ms. Lanier was also selected to lead the Pledge of Allegiance for the Remarks by President Barack Obama event on behalf of all Miami Dade College eight campuses. Post election, Ms. Lanier continues to endorse the importance of civic engagement as she and her team create a peaceful safe haven for the concerns and thoughts of the student body. Looking from the outside in, Ms. Lanier has also taken the opportunity to work for the Department of Elections as a poll worker for this past Primary and General Election. Her curiosity and appreciation for the entire process of registering, educating, and encouraging them to get out the vote comes to a bittersweet end as she also helps in the process of casting the votes of her neighboring community. As Ms. Lanier continues to express her passion for democracy, ability to stay firm in her beliefs and surplus of integrity, she will undoubtedly kindle the personality of the most engaged fellow.